I think one of the most asked questions is how I gather with clear elastic. It has changed the way I sew. NEVER ever ever use basting threads again. Nope clear elastic is the only way to go. You'll never have to mess with pulling threads or scratching your head about ruffle ratios to make gathers. You'll get PERFECT gathers that are exactly the right length ... EVERY time !!! 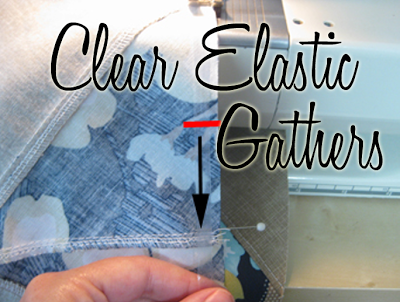 Here are my complete instructions for making gathers EASILY with clear elastic.